Bestowed is one of the most delicious boxes out there, and this month was no different! We were asked to review their box this month, and loved receiving it in the mail! Bestowed is just $19 a month and everything is chosen by celebrity nutritionist Heather Bauer. This box is SO filled, I decided to lay everything outside of the box so everyone had a better look at all that was in it! Nektar Honey Crystals , 2 packets of 0.1 oz. Amazon value $0.32. I was super excited to see these, as they are reasonable on Amazon, but wanted to try them before buying a box of 40! 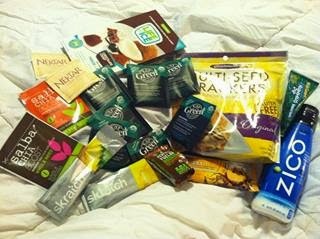 At only $19 a month, it is a great deal, and you get to try out so many new snacks before you commit to buying more than 1! 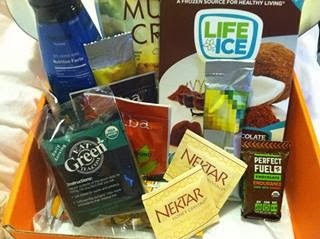 Just go to http://www.bestowed.com and used code HELLOTEN105 to save $10 off your first box! That means your first box is only $9!!!!! Fantastic value! MamaBreak received this box to review here on the site. We did not receive any other type of compensation. As always, our experience and opinions are our own. Links in this post may be affiliate links. We thank you for supporting MamaBreak!